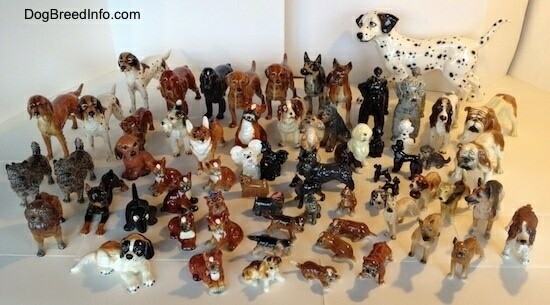 I have been collecting dog figurines for many years now. By far the ones made by Goebel are my absolute favorites. There is just something about them. Perhaps it's their deep colors or the way most of them look so realistic. Looking at them makes me smile. Here are some interesting tips on Goebels. 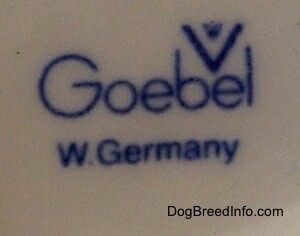 Goebel is a German company. Items made by the Goebel company are called ”Goebels.” The company Goebel used a lot of different artists to create their figurines. One popular artist is Sister Maria Innocentia Hummel (M I Hummel). She was the artist for the famous Hummels. She was born in May 21, 1909 in Massing, Bavaria, Germany. In 1934 Franz Goebel obtained an exclusive license to translate her drawings into three-dimensional figurines. Hummels are Goebels because it was the Goebel company that produced the items. Hummel is the artist. The first Hummels were sold in 1935. Sister Maria Innocentia Hummel died on Nov. 6, 1946 but her work lives on in the famous collectables. Hummels are the figurines that are based on M I Hummel's art. 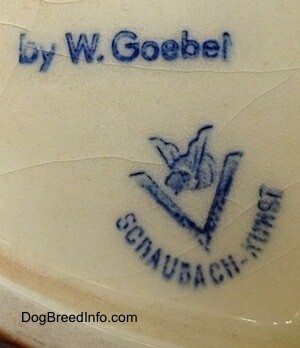 Most Goebels are not Hummels, as the Goebel company used many different artists over the years. Hummels were only a small part of their line. Therefore Goebels do vary in their style depending on which artist they are based from, but Goebel does an excellent job at not only choosing great artists but bringing out the best in the pieces when transforming the art into a 3D figurine. Another famous artist that worked for Goebel was Walter Bosse. Bosse was born on November 1904 in Vienna. He worked for Goebel in Oeslau between 1938 and 1957. He made a lot of unique odd-looking pieces. The Goebel company changed their trademark logo several times over the years. 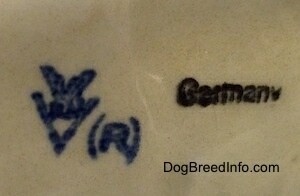 In order to determine the date of a Goebel figurine one must look at the logo. The Goebel company used different logo trademarks throughout the years that help collectors determine how old their piece is. Sometimes a figurine will contain a date stamp, however this stamp is the date the mold was made, not necessarily the date the piece was made. The trademark dates are as follows. Below are some examples of the different trademarks taken from my own figurines. I do not have examples of all of the trademarks yet. This trademark is the symbol of a crown. Under the crown are the letters WG overlapping one another, which are the initials of William Goebel. These very first Goebels did not contain the bee or the V in their trademark. 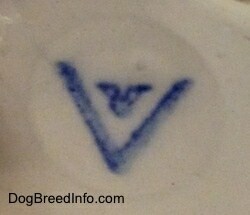 The mark was either incised into the porcelain (as shown above) or stamped on with green, blue or black ink, shown below. 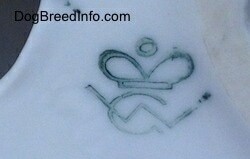 When two crown marks appear on the same figurine it is called a double crown mark. 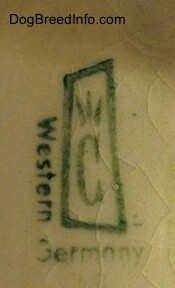 Pictured is the Goebel crown mark stamped on a figurine in green ink. 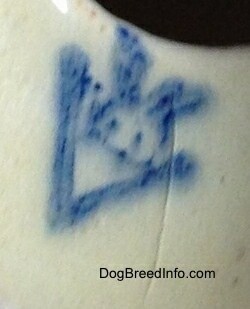 Pictured is a double crown mark, meaning the mark appears twice on the same piece. This one has the mark stamped in green and an incised mark below it. 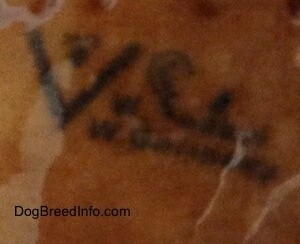 The incised mark is hard to see in this picture. The number 23 appears between the marks, which is the item number of the figurine. 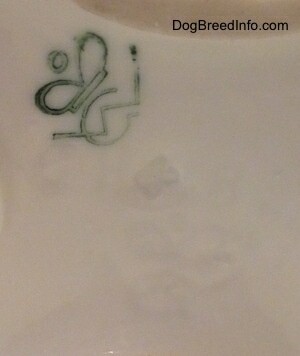 Pictured is the Goebel crown mark stamped on a figurine in dark green ink. 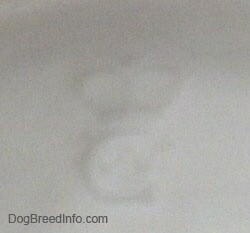 Pictured is the incised Goebel crown mark. This mark is narrower than the one shown above. Pictured is a double crown mark. One in blue ink under the glaze and the other incised. The incised mark is narrower than the stamped mark, meaning the crown is spaced closer together and the edges of the W do not fan out. It was in 1950 that the Goebel company implemented the bee and the V in memory of Sister M.I. Hummel, the artist behind the famous Hummel figurines. Hummel means bumble bee in German. The V stands for Verkaufsgesellschaft, which means a sales company. 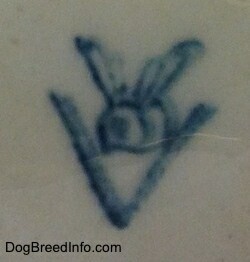 This is a Trademark 2 (TMK) example of the full large bee inside the V in blue ink with the registered (R) symbol. The word Germany is stamped in black beside it. Schaubach-Kunst is the artist. W. Goebel is the owner of the company. This image shows the TMK-2 logo with the full bee inside the V. Around the bee and V is an engraved circle. This circle’s purpose was to mark where the logo was to be stamped. To the right you can see Foreign stamped in black. There were at least two different marks used in this timeframe. 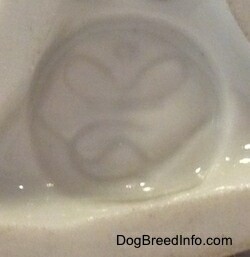 This image shows an example of the trademark 3 of a small bee deep inside the V. Around the V is an engraved circle. This particular mark was used on some pieces between 1957 and 1960. 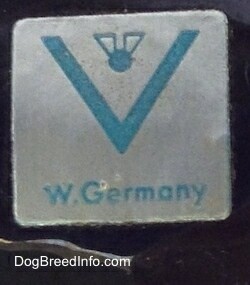 Another mark they used during the trademark 3 time period was of a small bee inside a V with the words W. Germany to the bottom right of the V.
The three-line trademark 4 (TMK-4) Goebel logo—this particular mark was used between 1962 and 1971. 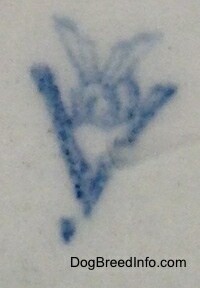 The three-line mark is of a large V with a bee inside it. To the right are the copyright symbol (C) and the word by. The second line says W. Goebel. The third line says W. Germany. 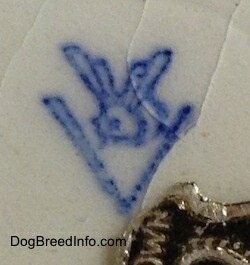 The silver and blue sticker that is sometimes used instead of a stamp—I find that some of the dog figurines Goebel used a sticker rather than the stamp. 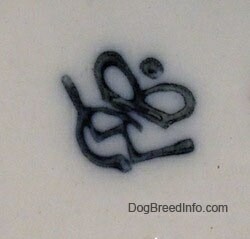 This may be because some of the dogs were so dark-colored that there was no way a blue or black stamp would have shown up on the figurine and the small paws of the dog were not a large enough area for the logo. That's my guess on the reason. Goebels usually have a number engraved into them as well as the trademark logo. Image showing the Goebel mark of the bee inside of the V right next to the words W Germany; above that is a w with the words Goebel. The G in Goebel is written in a fancy font. 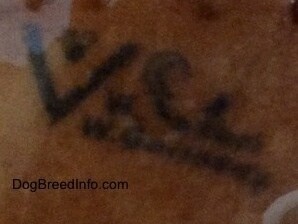 Image showing the Goebel mark of the bee inside of the V right next to the words 'W Germany'. Above that is a 'w. 'with the words 'Goebel'. The 'G' in 'Goebel' is written in a fancy font. 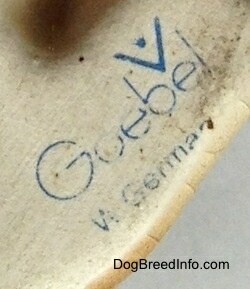 The bee inside the V above the 'bel' in the name Goebel; below that it reads W Germany. The bee inside the V above the 'bel' in the name Goebel; below that it reads 'W Germany'. The bee inside the V above the 'bel' in the name Goebel; below that it reads 'W Germany'. 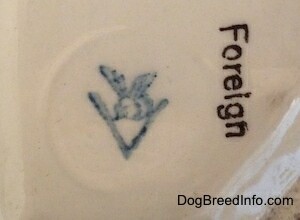 This particular one was stamped above the glaze, meaning there is no glaze over the trademark logo stamp. This is an example of the Goebel trademark 5 logo which contains the copyright symbol. 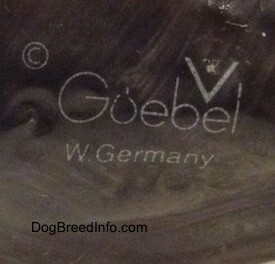 The name Goebel with W. Germany below it—this logo is what collectors call the ”missing bee” because this was the timeframe when the Goebel company did not use the famous bee inside the V in their logo. Starting in 2000 the logo once again included a bee. 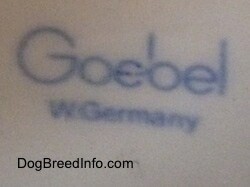 This trademark is of the name Goebel. Directly below the name it says Germany in a smaller font. 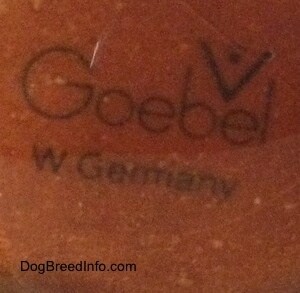 Some versions have the name Goebel with Germany directly below the name in a smaller font. Under the Germany is a symbol of a crown. Below that is a W and a 'G' overlapping one another. The crown marks only appear on Hummels. They will not appear on the other figurines. 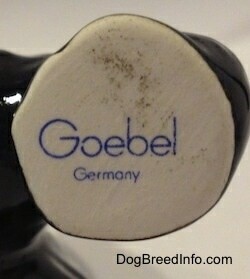 The name Goebel with a large bee in between the 'bel' in the name Goebel; under that it reads Germany. 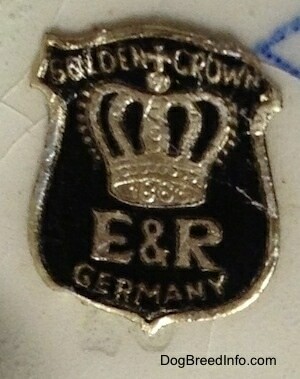 There is no V.
This Golden Crown E & R Germany sticker is on some of the figurines. The figurines also have the Goebel trademark stamps. The Cortendorf Porcelain Factory was a predecessor of Goebel, founded by Julius Griesbach in Coburg-Cortendorf, Bavaria, Germany, in 1890. The Goebel company bought the Cortendorf company in 1973 and renamed it Cortendorf W. Goebel. Image showing the Cortendorf logo of a crown with a C under it with a rectangle around it. On the left of the rectangle it reads, Western. On the bottom it reads, Germany. To the right of the rectangle it once said, Made in however the words are worn off.